SKEW should lead VIX, right? Traders get worried about a crash, which might anticipate volatility in the S&P 500. If SKEW was a perfect predictor of VIX, then you’d expect the blue line to look like the green line with a small gap in between them. The theory was that SKEW (in green) would pull up VI (in blue). A quick scan of the chart shows that’s not the case. There are occasions where green spikes up followed by blue, but it intuitively feels to me like a case of cherry picking. Also, notice the largest blue spike around value 500. If SKEW lagged VIX of the other way around. 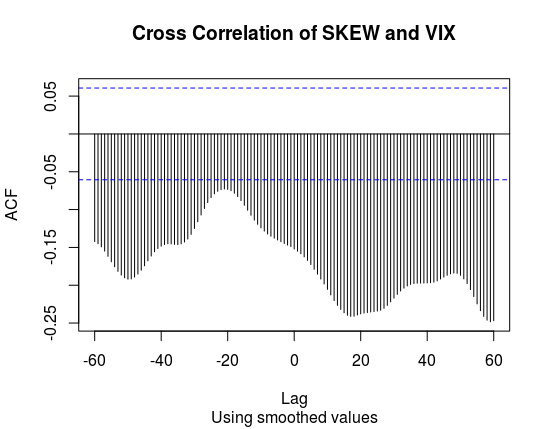 Just for the sake of being thorough, I measured the cross correlations of If SKEW and VIX using both my smoothed values and the unprocessed ones. Here’s the cross correlation of the smoothed values. And here’s the cross correlation of the unsmoothed values. If anything, the hypothesis is backwards. 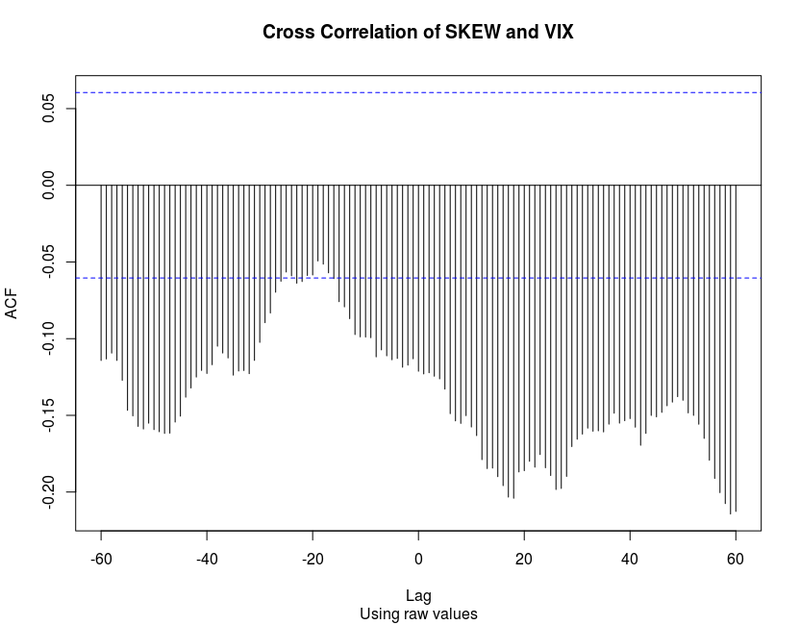 SKEW 18 days ahead of VIX has a -19% correlation. The correlation should be positive and > 40% to carry any substantial meaning. The weak correlation value and the fact that it’s negative that this idea is better tossed in the bin. Click here to download the data used in this analysis. 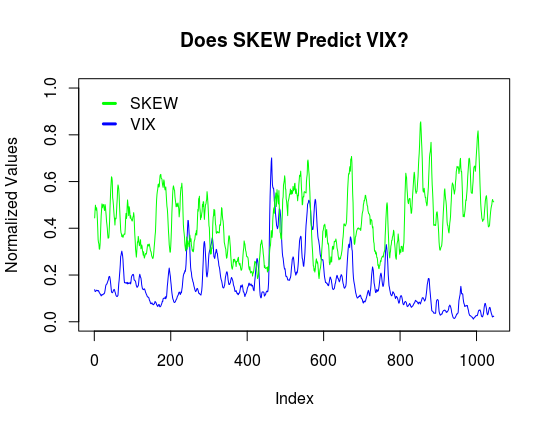 You’ll noticed that I first normalized the VIX and SKEW values to allow for easier visual comparisions. Because the data is extremely noisy, I applied a 7 day SMA to make visual comparisons easier. The data used was from October 16, 2013 to December 21, 2017. SKEW, which is another volatility index run by the CBOE, provides a measure of how worried traders are about tail risks. The crash of October 1987 sensitized investors to the potential for stock market crashes and forever changed their view of S&P 500® returns. Investors now realize that S&P 500 tail risk – the risk of outlier returns two or more standard deviations below the mean – is significantly greater than under a lognormal distribution. The Cboe SKEW Index (“SKEW”) is an index derived from the price of S&P 500 tail risk. Similar to VIX®, the price of S&P 500 tail risk is calculated from the prices of S&P 500 out-of-the-money options. SKEW typically ranges from 100 to 150. A SKEW value of 100 means that the perceived distribution of S&P 500 log-returns is normal, and the probability of outlier returns is therefore negligible. As SKEW rises above 100, the left tail of the S&P 500 distribution acquires more weight, and the probabilities of outlier returns become more significant. One can estimate these probabilities from the value of SKEW. Since an increase in perceived tail risk increases the relative demand for low strike puts, increases in SKEW also correspond to an overall steepening of the curve of implied volatilities, familiar to option traders as the “skew”. The Cboe Volatility Index® (VIX® Index) is considered by many to be the world’s premier barometer of equity market volatility. The VIX Index is based on real-time prices of options on the S&P 500® Index (SPX) and is designed to reflect investors’ consensus view of future (30-day) expected stock market volatility. The VIX Index is often referred to as the market’s “fear gauge”. The VIX Index is the centerpiece of Cboe Global Markets’ volatility franchise, which includes volatility indexes on broad-based stock indexes, exchange traded funds, individual stocks, commodities and several strategy and performance based indexes, as well as tradable volatility contracts, such as VIX options and futures. Hi Shaun and Happy New year to you and yours. Good to see you are back in the trading saddle again. I’ve been on the sidelines also for the past 6 months, due to a health issue which is resolved now. I want to get active again as I find the engagement interesting and it helps to keep my head active. Great to hear from you. I’m glad you’re feeling better. Yes I am following you with similar ideas and believe that you are on the correct track with futures for next 12 months or so. Keep me up to date with how best to enter the crypto possible futures. I am most interested as FX has been none profitable fo me during last couple years.